Life is uncertain. Nobody can predict tomorrow. Staying healthy is important as we don’t really know what’s in store for the future. With the globe undergoing so many changes, we are prone to diseases more than we were in the earlier decades. Chronic diseases popularly known as the ‘lifestyle diseases’ today, have become a part of our lives. Around 60% of the population of India dies due to either of the NCDs. Cardiovascular disease, strokes, COPD (Chronic Obstructive pulmonary Disease), Cancer and accidental trauma. Pune too has been facing the saddle of these diseases lately. How can we prevent ourselves from falling prey to these lethal diseases? Act preventive! The nuclear medicine radiology has been the fastest way of diagnosis today and is very useful in analyzing health conditions better. MRI scan is one of the best used tools and MRI scan in Pune helps in diagnosing problems associated with any part of the body with better captured images. MRI helps detect abnormalities of brain and spinal cord, bones and joints, tumors and cysts, heart problems, diseases of the liver and other abdominal organs, pelvic pain, fibroids and endometriosis (specially in women) and uterine and also evaluation for infertility. 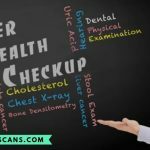 Including MRI scans in the master health check-ups is a great way to prevent the diseases that may cause trouble in the near future. And the best place to find your centers in Pune is Bookmyscans. We cater to more than 10+ locations in Pune and provide the best quality MRI scans at the center nearest to you. The social, financial, economical changes along with the lifestyle changes, we have seen an enormous shift in the patter of living to the length of growing number of chronic illnesses around. And are we coping up with the expenses that are sky high today? Besides food and shelter, healthcare is a major expense you incur at every phase of your life. How are we coping? How many of us are insured? All these questions are unanswered for many of us. Health stays better with prevention and you live healthy with preventive health check-ups. MRI scans are not something that you can take up regularly, but do not avoid to take an MRI Scan in Pune when it is really necessary. As we age, there are many ailments we encounter and pain becomes a part of our life. Pune is popularly known as “Retired Peoples Paradise” as most of the people love to settle down here after their retirement. This is because of the better quality of life in the city. Pune is home for around 25% of its population above 60 years, and better services in matter of home, food and healthcare are the most important ones for this population. Geriatric care is one of most developing care in India and why not, we have a fast paced aging population in our country. Diseases associated with old age can be listed as cardiovascular diseases, strokes, Alzheimer’s, Parkinson’s, arthritis, diabetes and cancer and the risk factors associated are hypertension, obesity, sedentary lifestyle and physical inactivity. And did you know most of these diseases apart from sysmptom analysis could be diagnosed with the help of MRI scans? Let’s have a look. The cost of a full body MRI scan in Pune is around INR 21,000 plus. The cost various across centers as different centers have technically different machines. But bookmyscans provides you the best price and we assure it is the cheapest MRI scan in Pune. 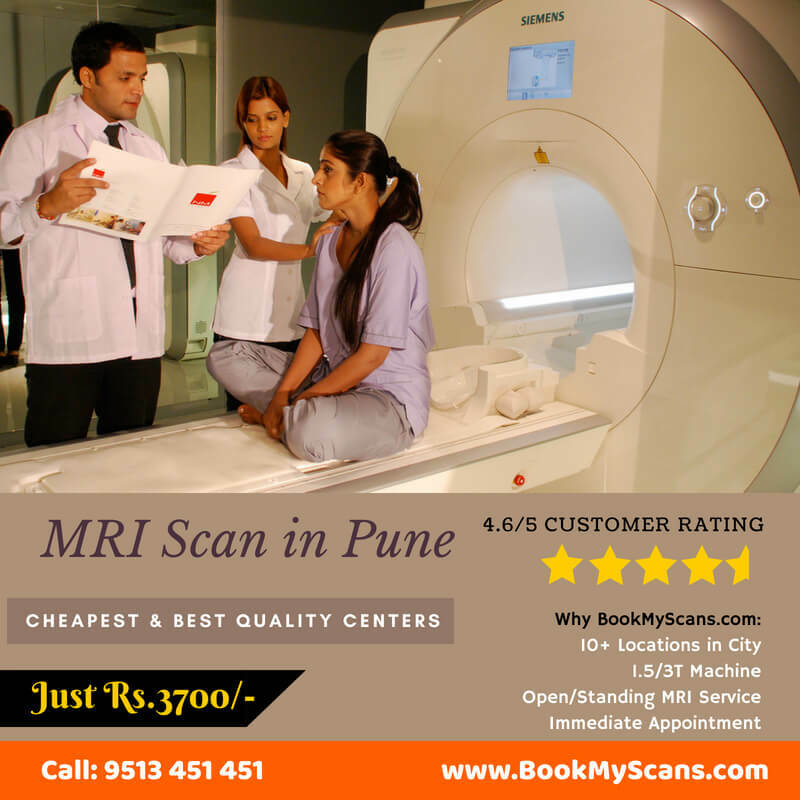 A single part MRI scan in Pune in reputed quality centers with bookmyscans is INR 3,500 – INR 5,000. Where can you find the Best MRI scan center in Pune? The quality of a MRI scan depends on the technology of the machine used by the center. As mentioned before, 1.5T are a most common scanners used across Pune. The city provides many diagnostic centers to cater the needs of the population, but to find the one that delivers the best quality healthcare services to all and that suits your requirement and that is affordable is a task. Bookmyscans eases this by providing the information about the best quality MRI scan centers in Pune. You can easily compare the prices online and book your appointments with the centers that are accessible and affordable. We have centers across the city at 10+ locations namely, Aundh, Saras Baug, Hadapsar, Chinchwad, Empire Estate, Pimple Saudagar, Vishrantwadi, Wanawadi, Shivaji Nagar and Kalyani Nagar. We, at Bookmyscans partner only with diagnostic centers that are approved to carry out these radiology tests, that is approved by AERB and one which are ISO and NABL certified. We also audit these centers periodically to make sure patients get the best quality services consistently and they meet the market standard of technical competence. Bookmyscans runs offers 365 days and you can book appointments for your diagnostic needs anytime of the day. You can avail assured discounts on the tests and save your pockets from the burden of cost. You need not go to the center to collect your reports, you can view the reports online and they can be downloaded as well. Try Bookmyscans today to save your health, wealth and time as well. Falling prey to high cost diagnostic services? The changing lifestyle and the burden of diseases have raised the healthcare needs of the people. There is a tremendous increase of infections and diseases occurring due to environmental changes like, air pollution, climatic changes including global warming, and chemical pollutants in the nature, technologic, or terrorist disasters. The cost of living is increasing and expenses of healthcare today are sky high. In a study by NSSO in 2014, 41 out of every 1,000 people were hospitalized in India due different reasons like to infections (24%) Cancers, Blood Diseases (11% each), Endocrine, Metabolic and Nutritional problems (10%), psychiatric and neurological disorders (7%), Eye (6%), Ear (5%), Cardiovascular diseases, respiratory and gastro – intestinal abnormalities (4% each). All these diseases can be diagnosed at an early stage with MRI Scans. You find many centers that provide MRI scan facility in Pune but have you noticed the difference in the price list? Every center charges a different price and people fall prey to it. We, at bookmyscans work with a motto of providing affordable healthcare to all and hence we ensure you get the best diagnostic services at affordable prices with best quality reports as well. The MRI scanners are circular and tunnel shaped machines. The tunnel inside is a large circular magnet. The scanners come in different powers and are measured in magnetic field strength units called Tesla. The most commonly used machines are 1.5T and the one with highest technology in the market are 3T machines. The machine has a table attached on which a patient needs to lie down and the table slides into the circular magnetic field. During the procedure, the scanner passes magnetic and radio waves to the part of the body being examined in short intervals and the protons in the body send back the radio signals. These emitted signals are then sent to the computer where the images are created to process further and analyze the results. The whole concept works around the elements called protons in our bodies. These protons respond to the radio signals that the machine sends to the body. The protons in the various body parts emit back signals differently and this helps the doctors to distinguish between the soft tissues and hard tissues. The part of the body being examined is backed by an aerial like device called the “receiving device”. This device is used to detect the radio signals emitted from the patient’s body. MRI scan is a highly defined and beneficial imaging test. The entire procedure takes around 15 to 40 minutes depending on the part of the body being scanned. In some cases the patient may need a contrast dye that helps in giving a clear image of the tissues and the organs being examined. The contrast dye may be injected into the veins of the patient (IV), the patient may be asked to drink it or it can also be given in the form of enema too. MRI scan is definitely beneficial but there are also a few risks involved. Prolonged exposure to the radiological waves during the scan increases the body temperature artificially which can be a risk factor during pregnancy. MRI scanners are noisy and produce noise of about 110 dBA (decibels), they almost sound like a mill or an aircraft engine. Therefore, just to reduce this discomfort patients may be given headphones to listen to some radio or music over a CD. The computer simultaneously captures the images but it might take a while for the radiologist to conclude on the results. Few patients may be claustrophobic and may need general anesthesia to keep them still during the procedure as movements during the scan may cause distortion in the images captured. Post scan, the patient may be asked to rest for a while and then let go. Diseases that MRI scans can diagnose. MRI Scans can diagnose a sudden injury, if the patient is suffering from inflammation or infection in the organs, degenerative diseases, strokes, muscular disorders, bone injuries, soft tissue damages, tumors or any other abnormalities in the body. Doctors have been really successful in diagnosing problems associated with the Brain and its diseases like stroke, brain abscess, hearing loss, dementia, multiple sclerosis, headaches and tumors. The chest and Breast MRI scan helps in detecting and diagnosing problems associated with the chest cavity, including the mediastinum, chest wall, pleura, heart and vessels. It is also useful in diagnosing the functioning of the lung and diagnosing breast cancer and damaged breast implants. How can MRI scan help in diagnosing different diseases? The Abdominal MRI scan is usually prescribed to scan the internal structure of the stomach. It helps check the blood flow, blood vessels, inflammation and infection, pancreas, liver and kidney and other associated abnormalities, including cancer in the abdomen area. 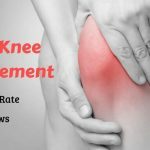 More than 80% of the population beyond the age of 55 years faces knee pain and MRI Scan of the Knee helps the orthopedician investigate the knee joints for tumors, arthritis, inflammation in the knees and broken bones or ligaments. Cervical MRI scan helps detect tumors, birth defects or any injuries to the spine as well. When a patient faces symptoms like numbness in the neck or the leg region and pain in the neck or arms a doctor may suspect problems with the cervical bone and nerves. Today we see a continuous growth of the MRI technology which has been helpful to examine more and more body parts. MRI scan is widely used in the field of clinical neurology, cardiology and Oncology and the advanced technology of this radiology imaging has been helpful to the physicians to diagnose problems with any part of the body providing a strategic base plan for the treatment of diseases. Missed Call us on 9513 451 451 for Book an Appointment for your Nearest Location.